No. I’m sorry. Let’s start again. Never in my life have I been afflicted with such a burning case of Non-Buyers Remorse. I am positively haunted. Having frequented innumerable flea markets and encountered many various once-in-a-lifetime acquisition opportunities in my day, I am confident in telling you that I consider myself no stranger to the non-buyer’s ailment. I have seen plenty of worthy marketeers struck low with it upon realizing that an item they had spied, but then lacked the temerity and good fortune to purchase, now lay in my sweaty, gleeful paws and was headed straight for the rack at Gravel & Gold. You and I both know that in such situations, when one spyifies with an eagle eye an item that savors strongly of the thing that only fierce haggling, perhaps a bit of rope, a flat bed truck, some out-and-out dollar bills and the right of ownership can satisfy, one must bid to win. Have mercy, I have never landed on this side of the coin! 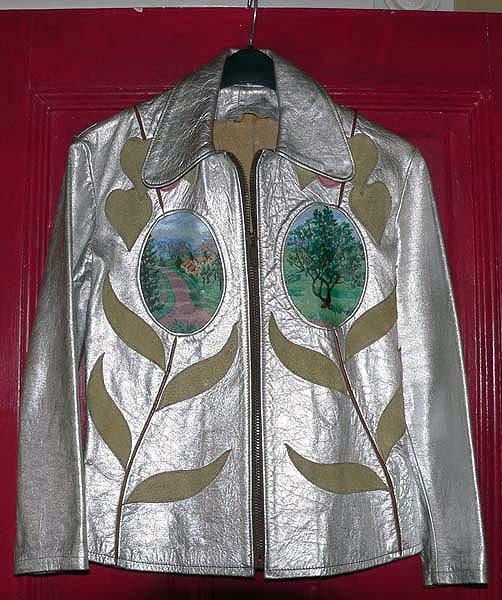 To have spied, and then failed to acquire, this most special shiny shiny jacket with the vine and heart cut-outs, the painted scenes of a lovely homestead and orchard, the minimal wear and tear, which maybe might be just my size and matches my new Mimi tote, is plain awful. After a flurry of futile attempts to find another, I can’t look at eBay any more. I can’t focus at the flea market. I can hardly dress myself—nothing in my closet compares. Dearest **vintagemylove, say you’ll shine a light on my dark non-buyer days and relist my beloved on eBay for a fraction of it’s selling price, with a Buy It Now option available only to me, shipping included, from a smoke-free home, and I swear to you I shall be ever in your debt. The post A Plea to End Non-Buyers Remorse appeared first on Gravel & Gold.